A Slice of Smith Life: Happy Blogiversary to Crunchy Catholic Momma! I just want to get the word out that Tricia over at Crunchy Catholic Momma is celebrating her 2 year blogiversary in a big and fun way! Congrats Tricia on blogging for 2 years! 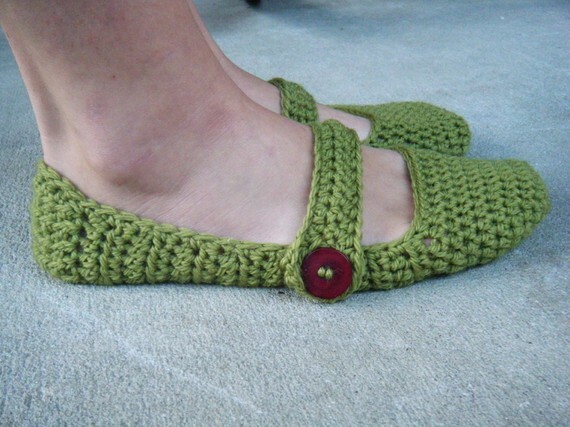 All this week she is having giveaways like these adorable 100% wool Mary Jane slippers that Tricia handmade! Tricia is so talented and raises a beautiful large family. I'm amazed of all the handmade items she makes on her Crunchy Crochet shop at Etsy! I first "met" Tricia when she had a giveaway for the LEGO rosaries she makes. . My name was randomly chosen as the winner! We are looking forward to receiving our rosary, like the one pictured above, that Tricia is designing just for our family! (I was able to pick the colors out for our rosary.) I can't wait to show it on my blog when I receive such a special gift! My children think that a LEGO rosary is so "cool!" Thanks Tricia! So hop on over to Crunchy Catholic Momma, be blessed, and wish Tricia a congrats! Join in on her giveaways too and you just might be one of her winners! What creative prizes! Thanks for sharing the details. Blessings! Oh wow! 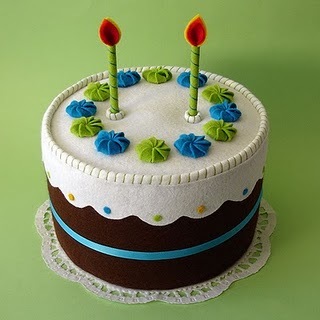 I love the picture of the felt cake. It is pretty cool. Thanks for the link to another great blogging friend. Have a wonderful day! Thanks for stopping by and commenting! I agree, there's a whole lot of creativity in these giveaways and Tricia's blog! Thanks for stopping by and commenting! You're right, each handmade item is made with such love and care!